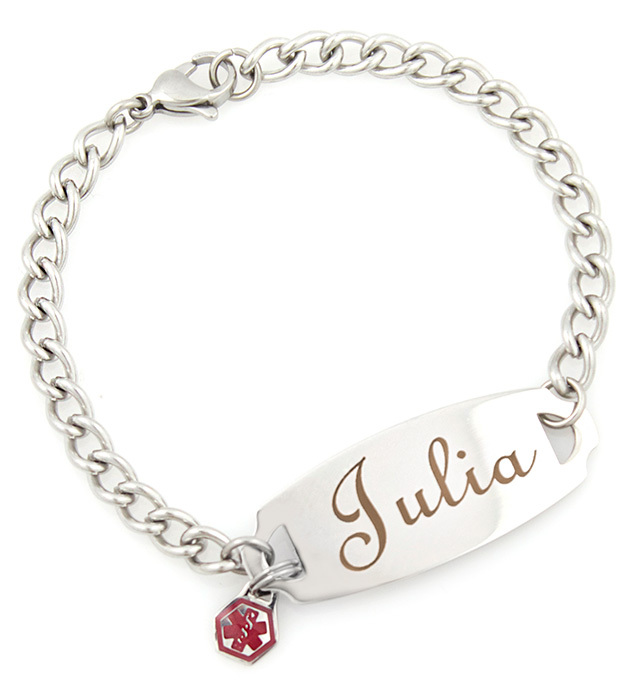 The Fontsy is a darling, yet durable, stainless steel medical ID bracelet with a small red medical caduceus charm dangling off one side of the affixed tag. To engrave your Fontsy medical alert bracelet, please use engraving fields for the text you would like on the back and the "special instructions" field for the name you want on the front. *Please note that the Fontsy is shown here with optional Premium Laser Engraving. Your Fontsy medical ID bracelet will be engraved on the front using the same method you choose for the back. If you wish to have Premium Laser Engraving on the front, please select that option for both sides in the engraving option screen.